The Fenix TK72R gives you a glimpse into the future of high-end flashlights. It is your smart aid for all search and inspection tasks and can even work as backup lighting during car trips. The extended display shows light output, remaining battery capacity and burning time. The Fenix TK72R illuminates everything in its path and guarantees a safe journey, no matter how long and rough it may be. The three Cree XHP70 LEDs together provide a maximum of 9000 lumens with which the wide beam reaches up to 286 meters. The lamp is operated by 3 buttons: 'on/off', '+' and '-'. You can switch in steps of 100 or 1000 lumens between 100 and 9000 lumens, giving you optimal control over the light beam and burning time. The TK72R is rechargeable via USB and also serves as a power bank. The included Li-ion battery delivers 7.2V and 7000mAh, which allows you to burn for 50 hours at 100 lumens or, for example, to charge your phone 5 times. The Fenix TK72R won the Red Dot Award for product design in 2017! If you are looking for maximum light output, maximum control and maximum versatility in a nice package, then the Fenix TK72R is the best choice. The FD65 is a powerful torch with many possibilities and therefore the perfect torch for heavy outdoor work such as search and rescue, caving and outdoor photography. The Fenix PD35 Led Flashlight is an all-round waterproof LED flashlight with a high light output. 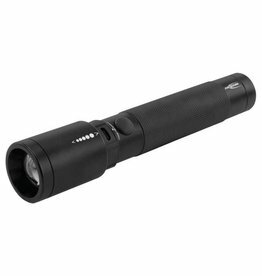 The Future T400FR is the latest flashlight of this popular series. Fast charging, aluminum and stepless focusing.